Parental neglect is firmly to blame in this low-budget potboiler scripted by the immortal Edward D. Wood Jr. Paula Parkins (Jean Moorhead) is a spoiled rich girl who turns to kicks when her parents become too engrossed in their careers and charity work. She leads a gang of similar-minded young ladies who rob gas stations and attack teenage couples parked in lovers' lanes (even sexually assaulting a hapless young romeo). Paula's father is the editor of the local newspaper and has inside information on the police's plans to catch the mysterious gang, so they stay one step ahead of the law thanks to dad's unknowing complicity. After a necking party with some gangsters, the girls pull a job for a local female crime boss who wants them to break into the high school and wreck a few classrooms. The reason why is never adequately explained (to the girls or to the viewer), but they take to the task with relish until the police arrive and all hell breaks loose. Tragedy ensues in the form of gunshot fatalities, car crashes, and death by childbirth behind bars. Ed Wood-o-manes may want to sully their pedicures in this one. Exquisitely dumbfounding melodrama about a quartet of tough high-school girls. HAHA ive seen this! god i need a hobby. Heh. Thanks to the folks at "Something Weird Video" I'm happy to say this is part of my collection. Considering the wooden acting, choppy edits, and laughable dialogue credited to Edward D. Wood, Jr. writing the screenplay, I really enjoyed this. These girls might look sweet and innocent, but don't let their faces fool you, as they're cold hearted criminals armed with guns and bullet-bras. It's an entertaining "spoiled, rich, tough-teenager" piece of...cinema. Ed Wood tries to cram as much in to fill a feature length film, so the end comes off as a bit preachy during the judge's closing comments. The final statement from Paula, the leader of the teenage gang, is priceless. Pour youself a stiff drink and enjoy this one. 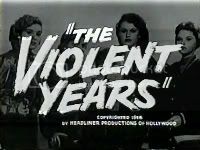 The best thing about this movie is the fact that it was written by Edward D. Wood, Jr. His absurd and (unintentionally) funny script really drives this ludicrous tale about a female gang.